Over at Zola Books, they posted the top 40 favorite books of the recently deceased computer whiz and activist, Aaron Swartz. He was a great lover of books and often wrote short personal reviews (you can see his lists over at his blog). Aaron’s list ran from great literature (Kafka! ), fiction (Wolfe, Wallace, Franzen), to all kinds of non-fiction. Today, prosecutors feel they have license to treat leakers of information like crime lords or terrorists. In an age when our frontiers are digital, the criminal system threatens something intangible but incredibly valuable. It threatens youthful vigor, difference in outlook, the freedom to break some rules and not be condemned or ruined for the rest of your life. Swartz was a passionate eccentric who could have been one of the great innovators and creators of our future. Now we will never know. Thanks for the link to Aaron Swartz’s reading list. The lawsuit against him was outrageous–his behavior was only arguably illegal, if illegal at all, and even JSTOR wanted it dropped (Max Kennerly’s blog, Litigation and Trial, has a detailed analysis of the case, originally published in July 2011 but updated to reflect recent events). 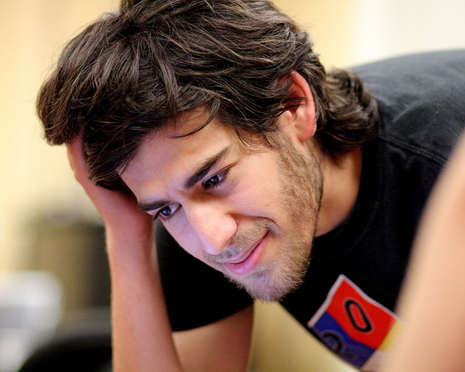 I hope changes to our justice system result from Swartz’s tragic death. I agree. Law prof’s article on the New Yorker was thoughtful and well-written and thank you for sharing the info about Max Kennerly’s blog). Aaron Swartz was a smart and interesting young man. I got great pleasure from reading through his book lists.